I know what you’re thinking: Pink tulips, again? 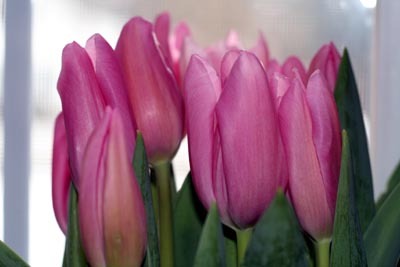 But these are very special pink tulips. You see, they were a gift from my father-in-law to thank me for making the cream puffs on Valentine’s Day. This gesture just about melted my heart, I tell you. And now you know why Dale is so thoughtful. He learned it from his dad. How sweet! (Purty, too.) I married a guy like that – his dad was a sweetheart and treated his mom like a queen, and taught his sons to do the same. How could I lose? 🙂 Happy weekend, Carole! that is sweet! and they’re so pretty. Beautiful! How sweet of Jack! You can show pink tulips anytime. I need to buy some flowers this weekend! Awww! Always enjoy your eye candy Fridays. We don’t live in tulip country, so I enjoy seeing them. That’s so nice! Like father like son. The tulips are lovely. Two generations of thoughtful men! You are so lucky!!! Unexpected flowers are the best. Especially tulips in February!I think I need some today, too. Pretty pink tulips. That is so sweet. How beautiful! Both the tulips and the thought behind them. Yea, girl, you got a keeper! Have a wonderful week-end…and hopefully we all won’t be buried in another 12 inches of snow…but, it doesn’t look hopeful! Further proof that gentlemen are raised – they don’t just “happen”! Awwww. What a nice family. Somebody definitely brought those men up right! Those flowers are gorgeous! I can see why they totally made your day!! Your aspen grove is looking mighty fine too! My first reaction was also, awwwwwww. What wonderful men. There is hardly anything that says spring in the same way! Gorgeous tulips and what fabulous men! How absolutely sweet! Unfortunately my father-in-law passed away before I got to meet him, but I think you’re right, a thoughtful son comes from thoughtful parents. Lovely flowers and a touching sentiment. I really do want to meet you in person! Not only is it thoughtful, but it’s brilliant – pretty flowers in the dead of winter will ensure he gets cream puffs for a long time to come! What I pretty thank you! Happy Friday! How wonderful to have a breath of spring in the winter! You’re blessed with two wonderful guys in your life. Those are beauties! I’m sure the cream puffs were too! How sweet! They are beautiful. There is nothing quite like perky tulips as we grow weary of the winter greys. oh my. such a loving FIL. so sweet. Awwww. So sweet. I love tulips this time of year when it still feels wintry outside.